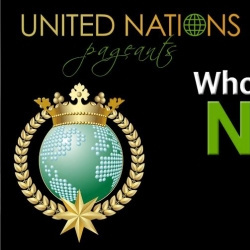 The United Nations Pageant has been conceptualized as a prestigious international event, bringing together representatives of a wide range of communities and cultures from all over the Globe; from the world’s most culturally diverse state, our delegates aim to share common values and foster international friendship and understanding. The pageant's principal objective is to identify and showcase the world's best tourism cause ambassadors; those who have the skills, talents and personalities best suited to promote their respective countries in furtherance of tourism, international goodwill and cultural harmony.Apart from a strong emphasis on goodwill tourism protection programs and destinations promotion. Pageant will is also aimed supporting environmental protection via strategized programmes.The United Nations Pageant will be held annually. These beauty King & Queens will cut across the countries from all Seven inhabited continents, making the United Nations Pageant truly global in its scope and appeal. Delegates will have the opportunity to visit and enjoy the beautiful state of Kingston,Jamaica the Host Nations, with its unique range of natural and cultural attractions, as well as other destinations in fascination. It is the organizers’ top priority to make the pageant a meaningful and rewarding experience for all delegates.During their stay they will be assured of VIP treatment, fun-filled holiday activities, and inspirational natural and cultural experiences. To ease the delegates' burden, the organizers will provide hotel accommodation, meals, local transportation, personal security and all basic expenditure items.